While pianist Gilson Schachnik and drummer Mauricio Zottarelli were both born in the state of Sao Paulo, it wasn’t until they landed in Boston that Brazilian music seized their imagination. Reared on hard rock, European classical music, blues, funk and jazz, they independently found their way to Berklee College of Music, earning scholarships to study at the prestigious institution. After swimming in a sea of Brazilianness, moving to the United States provided a sudden, jarring perspective shift, and a reappraisal of their relationship to their musical birthright. Their captivating new album Mozik reflects their deep engagement with Brazilian rhythms and forms, filtered through their love of the early fusion of Chick Corea and Herbie Hancock. The CD will be released October 28, 2011 on Mozik Records. Recorded in Boston with the support of a faculty grant from Berklee, the album features a fascinating international cast of US-based musicians, including Brazilian guitarist Gustavo Assis-Brasil, Russian flutist Yulia Musayelyan and Argentine bassist Fernando Huergo. The quintet navigates the intricate grooves with such precision and power it sounds like a working ensemble, though some of the musicians had never played together before. The album opens with Schachnik’s “Web’s Samba,” a tune that actually draws on several folkloric rhythms from the northeastern states of Bahia and Pernambuco, the heart of Afro-Brazilian culture. Zottarelli introduces the dramatic tune with a galloping afoxê beat, a rhythm drawn from Yoruba-inspired Candomblé ceremonies. The tune, like the album itself, is dedicated to the memory of bassist Webster Roach, a beloved Boston musician who died suddenly in Nov. 2010. The album features three incisive Schachnik arrangements of Jobim standards. There’s the brisk, up-tempo version of “A Felicidade,” the immortal theme from Marcel Camus’s 1959 film “Black Orpheus” that turned bossa nova into an international phenomenon. Rather than mining the tune’s potent undercurrent of melancholy, Musayelyan’s muscular flute work turns it into a straight up celebration. They close the album with a thrilling version of Paulo Cesar Pinheiro and Mauro Duarte’s “Canto Das Três Raças,” a song indelibly linked to samba legend Clara Nunes. Zottarelli’s percussion intro evokes the African roots of samba, while Musayelyan delivers the soaring melody with all the requisite soul. Whatever qualms Schachnik and Zottarelli once harbored about claiming Brazilian music as their own are washed away in this roots samba jazz celebration of Brazil’s miscegenated culture. Zottarelli credits Schachnik with sparking his interest in that heritage. Growing up in the 1980s, he mostly experienced Brazilian music through pop music on the radio. But his father was childhood friends with Dom Salvador, the supremely hip Brazilian jazz pianist who recorded a series of classic trio albums in the mid-60s. When some of those sessions were finally reissued on CD a few years ago, Schachnik brought them to Zottarelli’s attention, and the drummer eagerly explored music by an artist whose name he heard so often. He recently recorded an album with Salvador, who has long been based in New York City. Born and raised in the Sao Paulo, South America’s largest city, Schachnik started playing organ at 11, inspired by his love of Deep Purple and the band’s keyboardist John Lord. He broke into the Sao Paulo nightclub scene in his early 20s, and a few years later started accompanying pop singer Patricia Marx and touring with Rosa Maria. A busy studio musician, he also composed jingles for commercials and scores for an award-winning children’s television show. In 1990, Schachnik won a scholarship to Berklee, where he graduated with a degree in jazz composition. Since settling in Boston, he’s played or recorded with some of the most significant artists in jazz and Brazilian music, including Claudio Roditi, Bill Pierce, Romero Lubambo, Yoron Israel, Jerry Bergonzi, Luciana Souza, Mick Goodrick, John Lockwood, Paulo Braga, Peri Ribeiro, Antonio Sanchez, Miguel Zenon, and Cafe. Schachnik released his critically acclaimed debut CD, Raw in 1998. He has long worked at Berklee as an Associate Professor in the Ear Training department, and is also the accompanist for Wellesley College’s jazz choir, Body and Soul. Zottarelli grew up in the town of Rio Claro in the state of Sao Paulo, immersed in music. He earned a degree in computer science in 1997, but his love of music led him to apply for and earn a scholarship to a summer program at Berklee. When he came to Boston in 1999 he thought it was just for a season, but he kept earning new scholarships to study film scoring, arranging, and performance, and by 2002 Zottarelli had graduated from Berklee. With his versatility and wide rhythmic palette Zottarelli has become one of the most sought after drummers on the scene since moving to New York City in 2006. He’s toured internationally with Japanese pianist Hiromi’s Sonicbloom, while performing and recording with an international array of artists, including Eliane Elias, Marc Johnson, Prasanna, Esperanza Spalding, Keiko Matsui, Richard Bona, Claudio Roditi, Chuck Loeb, Rosa Passos, Jovino Santos Neto, Nilson Matta, Toninho Horta, Filó Machado, Cidinho Teixeira, Marc Rossi Group, Hendrik Meurkens, and Oriente Lopez. He co-leads Dig Trio and recently released his first album under his own name 7 Lives, which documents his evolving synthesis of jazz, Brazilian music and fusion. 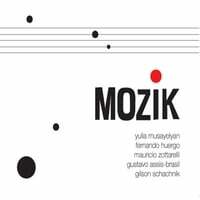 It’s a vision that he also explores with Schachnik on Mozik, a jazz album conceived by Brazilian musicians who approach the music of their homeland with fresh ears and open hearts.